Slides Online: The slides for the plenary and parallel talks have now been uploaded and are available online; if your slides are not online and you would like them to be, please email us. 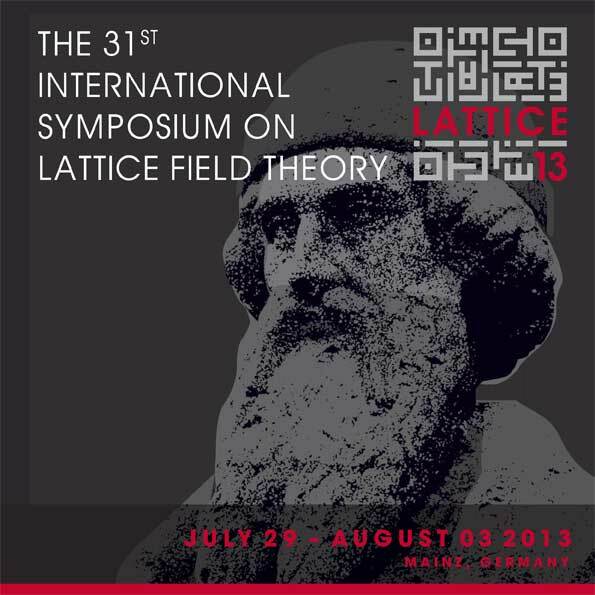 The 31st International Symposium on Lattice Field Theory was held at Johannes Gutenberg University Mainz, Germany from Monday 29th July to Saturday 3rd August 2013. The annual lattice symposium brings together a global community of researchers from theoretical particle physics and beyond, who employ numerical and computational methods to study the properties of strongly interacting physical systems, above all Quantum Chromodynamics (QCD), the theory describing the interactions of quarks and gluons. 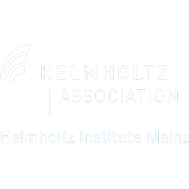 Topics included studies of the spectrum and structure of hadrons, lattice studies of matter under extreme conditions, hadronic contributions to weak decay amplitudes, as well as recent developments in simulation algorithms and computer hardware. The 503 participants came from all over the globe, with a particularly strong representation from Europe, the US and Japan. Further information for interested parties can be found using the navigational elements above and below. Lattice2013 will be held on the campus of Johannes Gutenberg University (JGU) in Mainz. All plenary and parallel sessions as well as the poster session will take place in the buildings of "Recht und Wirtschaft" ReWi I and ReWi II. How to get to Mainz and to JGU University. A collection of useful topics in alphabetical order. The city of Mainz and a selection of restaurants, pubs, and bars als well as sightseeing opportunities worth visiting. Monday, Tuesday, Thursday, Friday and Saturday mornings will be devoted to plenary sessions. In the afternoons of Monday, Tuesday, Thursday and Friday, as well as Wednesday morning we will have a parallel programme of up to seven simultaneous streams. 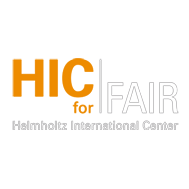 The welcome reception will take place on Sunday, July 28 beween 18 and 21 hours at „Proviant-Magazin" in Mainz. Information on five excursion options as well as time and place of departure. The conference dinner will take place on Thursday, August 1st at „Kurfürstliches Schloss“ in Mainz. Hotel bookings have to be done on your own. We have arranged for special rates in various hotels. 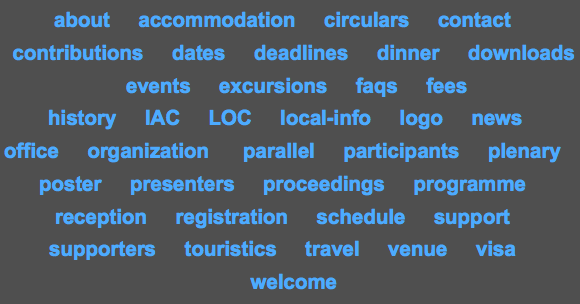 Please make sure to make bookings using the keyword LATTICE2013. Please notice the varying deadlines! Participation in the conference banquet, as well as lunch in the university mensa, is included in the conference fee. For other dining opportunities see our restaurant guide. Find here the list of contributions by topic, with information on sessions, times and seminar rooms. Find here the list of participants with names, institutional affiliations and email addresses. Information on financal support, i.e. reduced conference fee, and on application procedure. Please observe the German visa regulations. On-site check-in is possible during the Welcome Reception at Proviant-Magazin Mainz and, of course, at the Conference Office. Together with your conference package you will receive your name tag that at the same time serves as ticket for public transportation during the symposium. The Conference Office will be available to assist you during the conference. 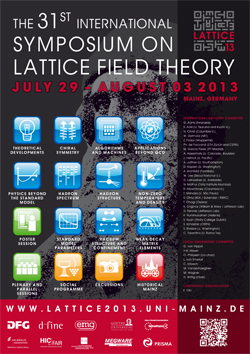 The Kenneth G. Wilson Award for Excellence in Lattice Field Theory will be awarded at the conference. A collection of questions that will be regularly updated. This booklet contents the complete scientific programme, maps and more useful information. Download sizes 5 or 18 MB. More documents: Book of Abstracts, Maps, etc.